Cutaneous leishmaniasis is endemic to the Pacific coast of Ecuador, and Nyssomyia trapidoi is considered to be its main vector. Dujardin et al. recorded some differences in body pigmentation and isoenzymatic profiles in sympatric populations of Ny. trapidoi from the Pacific coast of Ecuador and suggested the existence of two cryptic species. Entomological collections were performed in November 2008 and March 2011 in the locality of Paraíso Escondido using CDC miniature light traps and human bait. Morphological, isoenzymatical and molecular (sequencing of cytochome b and cytochrome c oxidase 1 of the mitochondrial DNA) analyses, such as detection of Leishmania DNA and phlebovirus RNA in some females, were performed. Neighbor-joining trees from mitochondrial sequences grouped all of Ecuadorian Ny. trapidoi (including the two color variants) in one cluster, except for two specimens which clustered separately in both genes. Isoenzymatic characterization confirmed that the color variants belong to the same population. Additionally, 11.5% of females were found by PCR to contain Endotrypanum monterogeii kinetoplastid DNA. All pools of Ny. trapidoi were negative for phlebovirus RNA. Analysis of mitochondrial gene sequences and isoenzymes was unable to support the existence of two sibling species within Ny. trapidoi, which is a probable vector of Endotrypanum monterogeii. Currently, 76 species of phlebotomine sand flies belonging to 17 genera have been reported for Ecuador ; of these, Nyssomyia trapidoi, Lutzomyia hartmanni, Lutzomyia gomezi and Lutzomyia ayacuchensis are proven vectors of Leishmania parasites . Leishmaniasis was first reported in Ecuador in 1920  and is now endemic in the coastal region. It is present in 22 of the country’s 24 provinces and purportedly has an incidence of approximately 1,650 cases per year  (likely unknown) in various clinical forms: cutaneous (CL), mucocutaneous (MCL), diffuse cutaneous (DCL) and recidiva cutis (LRC) [3, 6, 7]. In the Pacific region of Ecuador, the sand fly species Nyssomyia trapidoi is distributed throughout the western foothills of the Andes and along the coast and is an important vector of Leishmania (Viannia) panamensis[3, 8–10]. Ny. trapidoi is highly anthropophilic [11–13] and is commonly collected in secondary forests, crop plantations and close to human dwellings. The same features were observed in the original description of Ny. trapidoi by Fairchild & Hertig  who analyzed specimens from Panama (type-locality) and from the Ecuadorian Coast. A recent study in Panama found a high prevalence (43.3%) of Leishmania naiffi in Ny. trapidoi. In 1996, an entomological collection carried out in two communities on the north coast of Ecuador, obtained specimens of Ny. trapidoi showing a slight color variation. Additionally, isoenzymatic analysis revealed a possible presence of two species living in sympatry , although they did not correspond to the color variants. The purpose of the present study was to confirm the existence of two species under the name Ny. trapidoi at these locations. This report describes the results of an isoenzymatic and mitochondrial DNA analysis carried out on specimens of Ny. trapidoi collected in 2008 and 2011 at one of the locations described previously by Dujardin et al.. Moreover, we investigated the vectorial role of Ny. trapidoi for Trypanosomatids and phleboviruses. Sand flies were captured in November 2008 and March 2011 in the locality of Paraíso Escondido (00° 85' 03" N, 79° 17' 49" W), Pichincha Province, using CDC miniature light traps. Moreover, female sand flies were collected manually on human bait (captured on the skin of the authors). An out-group was analyzed consisting of specimens from Nicaragua (Musun), a place close to the type-locality of the species. Ecuadorian specimens were identified based on color phenotypes: light (B), dark (G) and indistinguishable (T). Specimens were killed using carbon dioxide and immediately stored in 96% ethanol for molecular studies and liquid nitrogen for isoenzymatic analysis. Once in the laboratory, the thorax of each specimen was separated and stored at −20°C for subsequent DNA extraction. The specimens used for isoenzymatic study and virus detection were processed as described below. The head, wings and genitalia of each specimen processed for morphology, molecular biology or isoenzyme analysis were cleared in boiling Marc-André  solution and mounted between slide and cover slide. The specimens selected for virus detection and isolation were individually identified in a drop of sterile saline solution under a stereomicroscope and pooled in groups of 50 belonging to the same species and of the same genus. The specimens we were unable to identify according to the latter method were stored at 80°C for future studies. Isoelectrofocusing was carried out in ultrathin agarose gels (MultiphorTM II Electrophoresis system, GE Healthcare Life Sciences) with the ampholyte at pH 4.0-6.5 in accordance with the protocols described by Pesson et al.. The following isoenzyme systems were tested: malate dehydrogenase (MDH, E.C.1.1.1.37), isocitrate dehydrogenase (ICD, E.C.1.1.1.42), glycerol-3-phosphate dehydrogenase (αGPDH, E.C.1.1.1.8), glucose-6-phosphate dehydrogenase (6PGD, E.C.1.1.1.44), hexokinase (HK, E.C.2.7.1.1), phosphoglucomutase (PGM, E.C.5.4.2.2), fumarase (FUM, E.C.4.2.1.2), and glucose phosphate isomerase, (GPI, E.C.5.3.1.9). The alleles for each locus were visualized as colored bands on the gels and numbered from the lowest to the highest pHi. Allele frequencies, tests for deviation from Hardy-Weinberg equilibrium and Nei’s  genetic distance between the two groups of sand flies were calculated using BIOSYS-2 . Genotypic linkage disequilibrium and genotypic differentiation were tested using GENEPOP 3.3 . DNA was extracted using the QIAmp®DNA Mini Kit (Qiagen, Germany) and following the protocol used by Depaquit et al.. Polymerase chain reactions (PCR) were performed for 30 Ny. trapidoi specimens. Each PCR was carried out in a 50 μl volume using 5 μl of DNA extracted solution and 50 pmol of the primers LepF and LepR  and C3B-PDR / NIN-PDR , as described previously, to amplify, respectively, cytochrome c oxidase 1 (COI) and cytochrome b genes from sand fly mitochondrial DNA. Amplification conditions for COI were as follows: an initial denaturation step at 94°C for 3 min followed by 5 cycles of 94°C denaturation for 30 s, 45°C annealing for 90 s, and 68°C extension for 60 s followed by 35 cycles of 94°C denaturation for 30 s, 51°C annealing for 30 s, 68°C extension for 60 s and, finally, a 68°C extension for 10 min [24, 25]. For cytochrome b, an initial denaturation step at 94°C for 3 min was followed by 5 cycles (94°C for 30 s, 40°C for 30 s and 68°C for 60 s) then 35 cycles (94°C for 30 s, 44°C for 30 s and 68°C for 60 s), with a final extension at 68°C for 10 min . PCR products were analyzed by electrophoresis in 1.5% agarose gels stained with 0.1% ethidium bromide. Amplicons were sequenced in both directions using the primers for DNA amplification. DNA sequences were edited using the Pregap and Gap programs from the Staden Package software . Sequence alignments were done using ClustalW software  and checked by eye. We selected a Neighbor-joining (NJ) analysis, which is a suitable method for intraspecific characterization of populations [28, 29]. NJ was performed using MEGA 4.0 software . Node support carried out using the NJ method was assessed by bootstrapping with 500 replications. Detection of trypanosomatid DNA was carried out by PCR using two segments: a 120 bp kDNA corresponding to the conserved region of kinetoplast minicircles (primers JW11, 5’-CCT ATT TTA CAC CAA CCC CCA GT-3’ and JW12, 5’-GGG TAG GGG CGT TCT GCG AAA-3’)  and the ribosomal small sub-units (SSU) (primers: KRD5, 5'-GATCTGGTTGATTCTGCCAGTAG-3' and KRD3, 5'-GATCCAGCTGCAGGTTCACCTAC-3') . As positive controls, DNA samples from Leishmania reference strains belonging to L. panamensis, L. guyanensis, L. braziliensis and L. peruviana were used. The conditions for these PCR reactions were the same as those described by Nicolas et al. and Clark et al..
Twelve pools, each containing 50 Ny. trapidoi sand flies (a total of 550 females and 50 males) were ground using a Mixer Mill MM300 (Qiagen) with a 3-mm tungsten bead at a frequency of 30 cycles s−1 for 3 min in the presence of 600 μl Eagle's minimal essential medium supplemented with 5% decomplemented calf serum, 1% L-Glutamine and 100 IU penicillin G ml−1, 100 mg kanamycin ml−1, 100 mg streptomycin ml−1 and 7.5 μg amphotericin B ml−1. The resulting mixture was clarified by centrifugation at 5800 g for 10 min and the supernatant fluid aliquoted (three aliquots of 200 μl for each pool) and stored at −80°C. One 200 μl aliquot was used for viral DNA and RNA purification using a BioRobot EZ1XL and the EZ1 Virus Mini kit (Qiagen), eluted into 90 μl and stored at −80°C. 10 μl was subsequently used in each RT-PCR reaction. Two sets of primers targeting different genes were used in independent reactions: (i) phlebovirus consensus primers targeting the polymerase gene in the L RNA segment , (ii) primers specific for the nucleoprotein gene in the S RNA segment of phleboviruses within the Sandfly fever Naples virus complex . The RT-PCR cycling conditions consisted of 48°C for 45 min and 94°C for 2 min, followed by 40 cycles at 94°C for 30 s, 45°C for 1 min and 68°C for 45 s, with a final elongation step at 68°C for 7 min. Nested PCRs were performed using the same conditions with 1.25 U Taq DNA polymerase (Invitrogen, USA). PCR products were visualized in a 2 % TAE/agarose electrophoresis gel and sequenced in both directions either directly or after cloning in a TA cloning vector. Pooled sandfly homogenates stored at −80°C were used to inoculate Vero cells. Briefly, 100 μl each homogenate was diluted with 900 μl Eagle's minimal essential medium without fetal bovine serum (FBS), but enriched with antibiotics (100 IU penicillin G ml−1, 100 mg streptomycin ml−1, 100 mg kanamycin ml−1 and 7.5 μg amphotericin B ml−1) and used to seed Vero monolayers in a 12.5-cm2 flask. After incubation at room temperature for 1 hr, 4 ml of fresh 5% FBS medium was added. The flask was incubated at 37°C in an atmosphere containing 5% CO2. Flasks were examined daily for the presence of a cytopathic effect, and 400 μl supernatant was removed and tested by RT-PCR after viral RNA/DNA extraction as aforementioned. Entomological captures using human baits resulted in 93% Ny. trapidoi, 4.2% Psychodopygus panamensis and 2.8% Lutzomyia (Helcocyrtomyia) hartmanni. Captures with CDC light traps yielded, in order of abundance: Ny. trapidoi, Trichophoromyia reburra, Pressatia dysponeta, Psathyromyia aragoi, Psychodopygus panamensis, Lutzomyia hartmanni, Psathyromyia abunaensis and Psychodopygus carrerai thula respectively (Table 1). Sixty-four Ny. trapidoi females were used for isoenzyme analysis and 550 Ny. trapidoi females and 50 Ny. trapidoi males were processed for virus detection. Of the males captured with CDC light traps, a small proportion was subsequently studied. They belonged to the same species as the females and most were Ny. trapidoi. They were stored at −80°C. Mitochondrial COI and cytochrome b sequences from 30 Ny. trapidoi females were obtained and submitted to Genbank (accession numbers JQ 322908 trough JQ 322968). Nucleotide sequences from COI amplicons (683 bp) revealed 31 variable sites, 10 of which were informative; cytochrome b (511 bp) contained 16 variable sites, two of them informative. The nucleotide composition was 37% T, 19% C, 28% A and 17% G for COI and 38% T, 15% C, 39% A and 9% G for cytochrome b. The alignment showed no indel in either sequence. COI sequences showed an average base substitution per site of 0.6% and cytochrome b sequences showed an average of 0.25%. There are more COI haplotypes than cyt b haplotypes. (Figure 1). 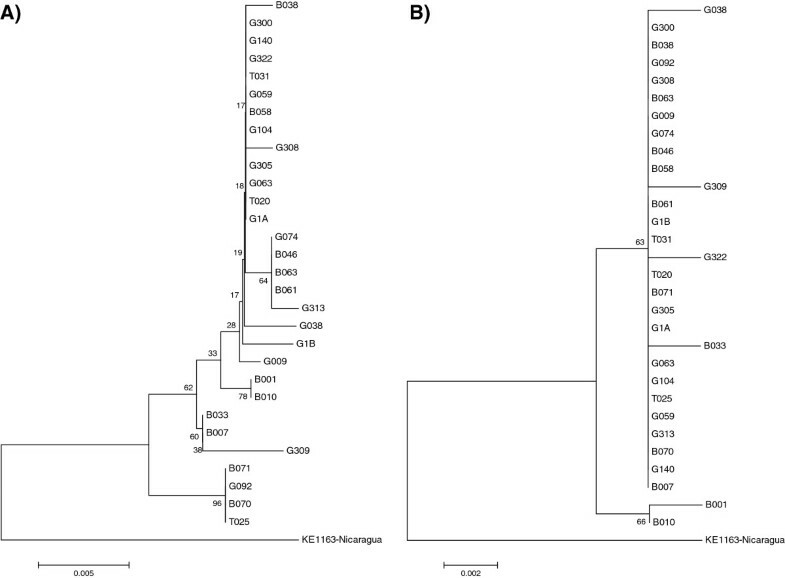 Neighbor joining trees obtained from nucleotide analysis of: A) COI mtDNA and B) cytochrome b mtDNA sequences of the 30 Ecuadorian specimens of Nyssomyia trapidoi and one from Nicaragua. Bootstrap values are shown in nodes (500 replicates). Since MDH and ICD each showed two distinct loci, a total of 10 loci were studied. Six of these gave clearly interpretable polymorphic patterns: GPI, PGM, HK, FUM, 6PGD and MDH1. Samples tested for αGPDH were monomorphic. Table 2 shows the number of sand flies and allelic frequencies at each polymorphic locus. n : sample size; P: probability of χ2value occuring by chance, when testing for deviation from Hardy-Weinberg expectations of genotypes frequencies. Both populations of light and dark sand flies were in Hardy-Weinberg equilibrium (P > 0.05). When combined as one group, only PGM deviated (P = 0.033); this disequilibrium was due to a deficiency of heterozygotes. There was no significant linkage disequilibrium for either populations tested alone or grouped together (1 > P >0.180). Nei’s genetic distance value was 0.004 and there was no genotypic differentiation between light and dark Ny. trapidoi ( χ2 = 12.309, P = 0.421). Out of 78 Ny. trapidoi females tested by PCR for the presence of trypanosomatid kDNA, 9 (11.5%) were positive. BLAST analysis of the 120 bp PCR products failed to reveal any significant score. However, 8 out of 78 kDNA PCR positive females were also PCR positive for the SSU rDNA locus. All the 2,135 bp sequences obtained from our samples were similar and showed 100% identity to the Endotrypanum monterogeii sequence (X53911) described by Fernandes et al.. One sequence was deposited in Genbank (JQ863389). The results of this study confirmed that Ny. trapidoi is the most common species captured  in the Paraíso Escondido community in the central coastal region of Ecuador. Two other anthropophilic species, Psychodopygus panamensis and Lutzomyia hartmanni, were recorded at this locality. Other non-anthropophilic species, i.e. Trichophoromyia reburra, Pressatia dysponeta, Psathyromyia aragoi, Lutzomyia hartmanni, Psathyromyia abunaensis and Psychodopygus carrerai thula were also collected there (Table 1). Molecular (mtDNA sequencing) and isoenzymatic analyses did not support the existence of two populations (possible cryptic species) at Paraíso Escondido as previously hypothesized by Dujardin et al.. The topology of the NJ tree obtained using cytochrome b sequences (Figure 1) grouped all Ecuadorian Ny. trapidoi into two clusters. The first cluster comprised the specimens B001 and B010 and the second cluster grouped the other specimens. This dichotomy is supported by only two nucleotide substitutions (positions 222 and 482). The Ny. trapidoi from Nicaragua differed from the Ecuadorian specimens in 12 nucleotide positions (Figure 2). Variable nucleotides found in DNA sequence alignments. A) COI mt DNA (683 bp) and B) cytochrome b mtDNA (511 bp). Identical bases are represented by dots. Numbers above indicate the positions in the nucleotide sequence. On the other hand, the NJ tree of COI sequences showed 5 clusters (Figure 1). The main branch included many of the specimens sharing the main cytochrome b haplotype. Another branch includes the B001 and B010 specimens, which grouped exactly as in the cytochrome b NJ clustering, thus perhaps warranting additional studies. These two specimens differ from the main haplotype by two nucleotide positions: 35 and 642. Specimens B007, B033 and G309 make up a third cluster that is supported mainly by one mutation. The fourth cluster (specimens B070, B071, G092 and T025) is strongly supported by seven positions (Figure 2). It is interesting to note that there is no correlation between haplotypes and color phenotypes. In this case, the COI gene provided a greater level of stratification than the cytochrome b gene. Isozyme analysis suggested that the two color variants are conspecific Ny. trapidoi, and we did not find any variation of αGPDH profiles in our samples. However, the electrophoresis protocol used by Dujardin et al. was different from that used in this study. Ny. trapidoi is known to be an efficient vector for the vesicular stomatitis virus (Vesiculovirus) [36, 37]. According to our study, there is no evidence for the circulation of any phlebovirus in Ny. trapidoi in the locality of Paraíso Escondido. In this work, we processed 78 Ny. trapidoi females, 2 engorged on human blood and the rest unfed. 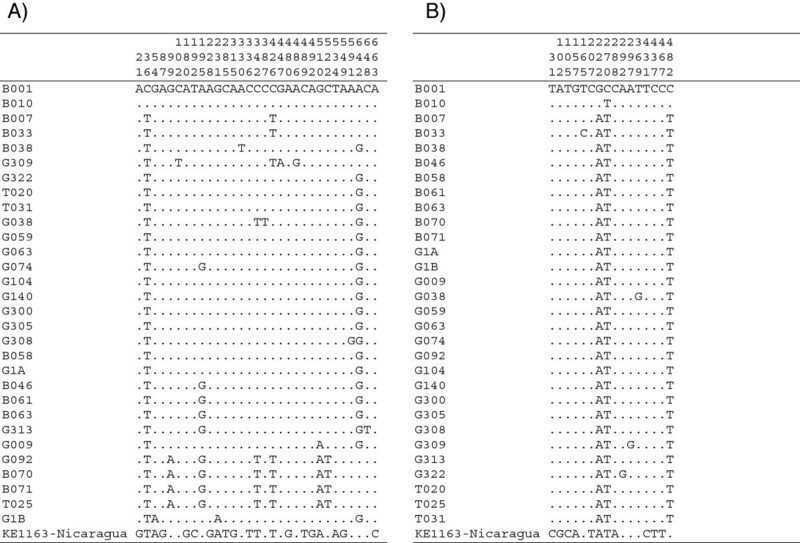 Nine (11.5%) of the unfed sand flies had identical trypanosomatid kDNA sequences and showed no homology to Leishmania panamensis and L. guyanensis, species commonly found in N. trapidoi. However, SSU rDNA sequences (2135 bp) from the same specimens showed 100% homology with the Endotrypanum monterogeii sequence (GenBank X53911) obtained from a sloth (Choloepus hoffmanni) and described by Fernandes et al.. Moreover, our sequences showed a high homology (over more than 2100 bp) to sequences described as Endotrypanum sp. by Ferreira et al. : 99.7%, homology to Endotrypanum isolated from Lutzomyia gomezi (EU21238) and 99.8-99.9% to isolates from Psathyromyia dendrophyla (EU21239, EU21240). If we consider this variability as intraspecific, it might suggest that E. monterogeii has a wide spectrum of vectors, including the genera Lutzomyia Psathyromyia and Nyssomyia. Although sloths were common in study sites some time ago, they are now rare, and other vertebrates may play a role as reservoirs. Further studies are needed to learn more about the vertebrate hosts of E. monterrogeii, since to date our knowledge is limited to C. hoffmanni[35, 39]. The authors are grateful to Anita Freire, Soledad Tello and Moisés Gualapuro for their invaluable support in entomological collection and field work. This work is part of the @ SPEED-ID “Accurate SPEciEs Delimitation and IDentification of Eukaryotic Biodiversity using DNA Markers” project proposed by F-BoL, the French Barcode of Life initiative, funded by the French National Center of Sequencing (Genoscope) and supported by the National Secretariat for Higher Education, Science, Technology and Innovation (SENESCYT) of Ecuador. SZ, FLP, RL & JD were responsible for the conception and design of the work and have been involved in drafting the manuscript. SZ & BP carried out the isoenzymatic analysis and have given final approval of the version to be published. SZ, JD and CR did the parasitologic study and have given final approval of the version to be published. CC did the sequencing of the samples through the project @speed-ID and have given final approval of the version to be published. LM & GT helped with collecting and processing the samples, revising the manuscript critically and have given final approval of the version to be published. LB and RC carried out the viral study, critically reviewed the manuscript and have given final approval of this version to be submitted for publication.